Women at Sea is a brand new non-fiction book written by Brianna Snider. Filled with true stories from women sailors in various roles onboard different types of ships, this book gives you the reader an accurate depiction of what it is truly like to be a woman sailor. 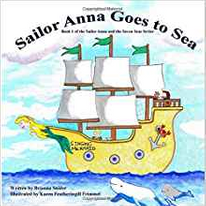 Brianna has weaved her own sea stories into the book having worked at sea as a deckhand for the Canadian Coast Guard. Be prepared to be shocked, laugh, and be awe-inspired, by these brave women who chose to share their tales from sea. Or a signed copy can be purchased under products!